According to Stand Firm the Rt. Rev. Keith Ackerman, bishop of Quincy, Illinois, has announced his intention to retire effective from the beginning of November. Bishop Ackerman's health has been troubling him for some time, and we should be sure to continue our prayers from his physical, emotional, and spiritual well-being and for the continued flourishing of his family during his retirement. He is scheduled to preach and celebrate at St. Vincent's Cathedral on Thanksgiving. In other convention business, delegates approved a $600,000 budget and approved resolutions to provide Episcopal Life and Episcopal Life/San Joaquin publications to all members and constituents of the diocese; and to authorize missionary outreach to establish new congregations. The Executive Council, meeting October 23 in Helena, Montana, renewed its ongoing support of San Joaquin and other dioceses in which the leadership has left or plans to leave the church, and pledged the church to seek reconciliation "without precondition on our part." RWF resumes: As I understand it, the 19 "congregations and faith communities" represented at the 815-loyalist diocese's convention included some delegates drawn from small 815-loyalist contingents arising out of parishes that departed from TEC last year. They are, I believe, seating these folks as the representatives of parishes where the substantial majority of the members no longer consider themselves to be within the bounds of TEC at all! But even with the use of this questionable tactic, their 815-loyalist group still claims only 19 "communities" compared to the Southern Cone diocese's fully-functioning 37 congregations. I would be very interested in seeing how much of that $600,000 budget actually originates in their "diocese" and how much is provided from New York City. The entire text of this news story may be found here. If anyone out there reading this believes that parish life in an 815-loyalist "diocese of Fort Worth" would not be radically different than parish life here is today, please read the story carefully and take note. The folks running the "Steering Committee" here (your future "diocesan leadership") will most likely be following this blueprint. Please don't vote to stay inside TEC at our convention next month in order to "keep things just the way they are." Your new 815-loyalist "diocese" will resemble Newark or California or Chicago far more than it will resemble the present diocese of Fort Worth! There are plenty of people out there who want it to be so! Wannabe Anglican has posted very good news today. The Reformed Episcopal Church has just endorsed the Jerusalem Statement of the GAFCON movement without opposition. Their Presiding Bishop, Leonard Riches, has predicted that we are only weeks away from the formation of the new orthodox province (most likely in December)! Upon the hearty recommendation of Presiding Bishop Leonard W. Riches, the 52nd General Council of the Reformed Episcopal Church has just affirmed the GAFCON Statement and the Jerusalem Declaration by a rising vote. There was no opposition. Today is a great day. RWF resumes: This is great news! We are on the brink of closing a breach that has gaped in North American Anglicanism for more than 130 years. The new province will include orthodox churchmen of all stripes, united in their affirmation of the authority of Scripture and the truth of the Gospel. I cannot wait! It is only three weeks now until the diocese of Fort Worth votes on departing from the General Convention of the Episcopal Church and moving to temporary shelter within the Southern Cone. We get that done, then join the newly-formed orthodox province at the end of this year or early next year, and finally we can put the folly of the national TEC behind us! Tis a consummation devoutly to be wished! The four of us [i.e., dioceses of Quincy, Pittsburgh, Quincy, and Fort Worth] have agreed to come under Southern Cone which becomes the first Anglican Province to stretch pole to pole, from Tierra del Fuego to the Arctic Ocean as Canada and its Anglican Network in Canada are part of our relationship of the four dioceses in the states, all under the Southern Cone. This is a temporary measure. It is quite clear that when the four of us bishops who are to come under Southern Cone met with the House of Bishops of the Southern Cone in August 2007, that the Southern Cone was simply making a temporary refuge for us until we could create a North American province together. I would like to speak about the North American Province. Many of you are aware of the GAFCON statement this past summer and the readiness of the Fellowship of Confessing Anglicans and the group that met in Jerusalem to recognize a second province which would be both Canadian and US. We have worked together in a group called Common Cause Partnership. Right now that is eight jurisdictions, both US and Canadian. Those jurisdictions together represent 30 bishops, 800 clergy, 700 parishes, a worshipping community of about 100,000. That makes it larger than a third of the provinces of the Anglican Communion in that sheer number of people who worship on Sunday. We are committed to one another. The Common Cause Partners, while it has been a federation, is moving to a greater level of integration. I function at this point as the bishop who presides in that body as the moderator of that partnership. We have really grown together in substantial ways. The thing that would be most surprising to our English brothers and sisters is the extent to which we have been able to bridge the divide over the ordination of women. We actually are a body that has both those that ordain women and those that do not ordain women and there is a level of respect among us that is something that only the Lord could do. The strongest indication of that respect is that Forward in Faith and jurisdictions that do not ordain women have repeatedly chosen me who very clearly supports the ordination of women as their spokesman and leader. That might not happen in other parts of the Anglican Communion but hopefully it is part of our reality. Read the entire report at Anglican Mainstream. 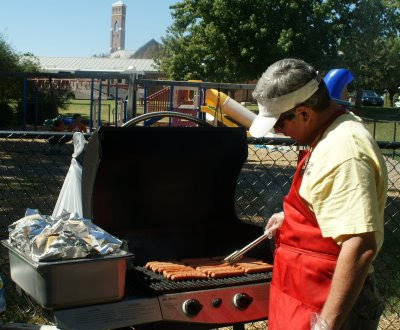 Saturday was our St. Vincent's Cathedral Church and School Carnival. It was a huge success! Hundreds of people came from all over the area to sample the chili prepared for the Chook Off and to play games. Above is a shot of me trying (and failing) to dunk Dean Ryan Reed in the dunk tank (below). [I can think of certain ecclesial dignitaries who probably wouldn't mind seeing the leadership of our diocese perched precariously on a ledge inside a steel cage!] There were games for all ages. The school's soccer field truly had the feel of a real carnival midway. About fifteen teams competed in the Chili Cook Off. Their preparations were uniformly delicious! And many of the booths were quite creative. 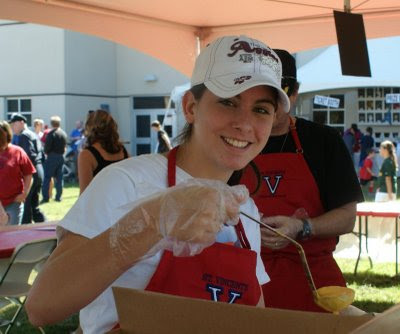 More than 100 people from our parish and our school volunteered their time for the Carnival. Thanks so much, folks! There were plenty of colorful characters, like our own Fr. John Jordan (below). And if chili wasn't your cup of tea there were plenty of brats and nachos and snow cones to be had. That, btw, is one of my finest Theology students from the last three school years, Caroline U., working with the nacho cheese (above). Caroline is perhaps the only person I know who can discourse learnedly on melting nacho cheese as a "type" of Salvation History! Her dad, Larry, manned the grill with skill. A grand time was had by all. Thanks to all who made this Carnival such a success this year, particularly Mrs. Holland and Mrs. Graber. Photos by my father, Randy Foster. Thanks, Pop! At the same time as these conversations were going on, a group of diocesan officials from Fort Worth were meeting with our counterparts in the Diocese of Dallas to see if a pastoral agreement could be worked out between our two dioceses, whereby parishes in Fort Worth that wanted to remain in TEC could do so as part of the Dallas Diocese. These meetings included the Bishops, Chancellors, Canons to the Ordinary, and Presidents of the Standing Committees of the two dioceses. We came up with a proposal whereby, under certain conditions, Fort Worth parishes and clergy could have “associate membership” in Dallas, including seat, voice and vote at their Convention, and their property could be placed temporarily in the name of the Corporation of the Episcopal Diocese of Dallas, to be held in trust for their use. This plan was then presented to the Rectors, Wardens and Chancellors of five Fort Worth parishes that we thought would like to pursue such an arrangement, at least on a trial basis. They were asked to discuss the proposal with their vestries, and then we would meet a second time for further exploration. Unfortunately, at that second meeting, the Chancellor of Dallas reported on conversations he had initiated with the Presiding Bishop’s Chancellor, David Booth Beers, about the proposal under discussion. Mr. Beers stated that neither the PB nor the General Convention would support such a plan, and without their support, the Fort Worth parishes were unwilling to continue steps to implement the plan. In the final meeting of the clergy discussion group in September, there was an open and honest exchange of views about where this left us. The differences appear insurmountable. No minds were changed as a result of these meetings, and no clear solutions were found that the group could propose. Although it was said that no one wants litigation, it appears that the two opposing sides in this controversy are headed in that direction. RWF resumes: So while the leadership of the two Metroplex dioceses were doing everything they could to avoid costly and damaging litigation should our diocese vote--as expected--to end our union with the GenCon of TEC, the national leadership in New York (especially the PB and her lawyer) has determined that any attempt at a peaceful parting of the ways must be crushed. It is clear that 815 intends to pursue the same strategy in Fort Worth that they pioneered in San Joaquin last year. It is shameful to think that PB Schori and her lawyer would undercut these talks, aimed as they were solely at fostering an amicable parting of the ways. How can they possibly justify this to themselves? Do they really think they can stop us from leaving by threatening to take away all of the property that we use to accomplish our missions and ministries? We have all been resigned to those lawsuits for a long time, and are confident that we can triumph in court if it comes to that. But these lawsuits need never be filed in the first place! PB Schori's tactics here are directly analogous to an abusive husband trying to keep his wife from leaving him by threatening to track her down and harm her and their children if she ever tries to go! "I love you so much that if you try to leave me I will have no choice but find you and destroy you." Charming. No, 815 cannot possibly think they will keep us from re-affiliating by means of these tactics. They simply want our property. Please remember, our diocesan leadership was doing all it could to find a just and peaceful way for those parishes that want to stay loyal to GenCon and PB Schori to do so and keep their property. But PB Schori must have it all! The congregation and clergy of St. Vincent's Cathedral, it seems, simply must be kicked off our property and those assets sold off if we re-affiliate. This would be the inevitable outcome, after all, if 815 won our parish property in court. Virtually the entire congregation of St. Vincent's will support re-alignment. The TEC loyalists could not possibly keep our buildings operating if they ever won them in court. The school would surely be closed immediately and the buildings put on the market. How can those who support this litigious scheme possibly do so in good conscience? I cannot imagine. One can only hope and pray that common decency will carry the day in the end and the five parishes will refuse to participate in PB Schori and Canon Beers' litigation plans. Let us part on as good terms as possible, not in bitter court disputes! Words fail me in describing how this sorry spectacle makes me feel. CT: How will conservatives negotiate the issues that divide them—women's ordination and related concerns? Is there going to be a theological center? +BD: The theological center on first-order issues has deep agreement. Most of us hold the issue of the ordination of women to be a second-order issue. We are committed to working with our partners in the communion as we try to come to some lasting agreement. The way I illustrate that is we are now wise enough to understand that we can't settle the issue of reception of the ordination of women. The reason we can't settle it is that East Africa ordains women and West Africa doesn't. We have got to go through this together, and it's going to take a couple generations to do it. There's a deep commitment to one another across this divide. CT: Are you confident that there will be a new province for the North American Anglicans a year from now? And are you the most likely person to be the primate of that province? +BD: The simple answers are yes and yes. I do believe that the Common Cause partners will put everything in place that we need to put in place by Christmas. The time has come. In terms of my leadership I think I understand, and those who put me in this place understand, that in this particular moment my task, my call has been to bring the partners to a place, to the creation of a province and to the beginning of its life, and then I'll be happy to give it over as soon as it's clear that I'm not called to do it anymore. We will operate in a way in which the primate of the province is a diocesan bishop, will serve for a term, and may be reelected for a term. Then another will take up that primacy. RWF resumes: This is very good news! It confirms what I heard at the Common Cause North Texas meeting last month. One can hope that in December, or very early in the new year the GAFCON provinces will act to recognize us as a province! Glory! Tonight the St. Vincent's School chapter of the National Junior Honor Society inducted nine new members into it's ranks. The induction ceremony took place in the context of the Holy Eucharist. Congratulations to all of the members of the Society. I am very proud of you. The photo above, taken by my father Randy, shows all of the present members of the Society. The photo above shows our Head of School, Dr. Mary Dickerson, addressing the new members on the importance of scholarship, character, leadership, and service before they received their membership cards and pins. Dean Ryan Reed of the cathedral was our celebrant, and is shown above blessing the membership pins before they were presented to the new members. 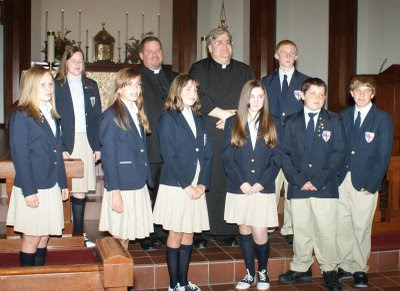 I was honored to preach at the Eucharist tonight in my capacity as school chaplain and faculty sponsor of the NJHS. It was a marvelous evening! Below are the new members inducted this year. Congratulations, again! Tonight the St. Vincent's Middle School Lady Eagles concluded their marvelous 2008 season with a second place finish in the Christian Schools Athletic Fellowship tournament. That capped off a 10-0 regular season, which resulted in the pennant for the Eastern Division of the CSAF. They won their first game in the tournament in straight sets, but lost a close championship game to Fellowship Academy of Arlington this evening. It was a very exciting tournament to watch in person, I can tell you! Above are three of the girls on the squad who received special honors tonight. Emma D. was named an All District player, and Stephanie C. and Rachel M. were named All Tournament players. Congratulations to all the Lady Eagles on a spectacular season! And while I am on the subject of my beloved St. Vincent's School, check out the 2008 school photo below. 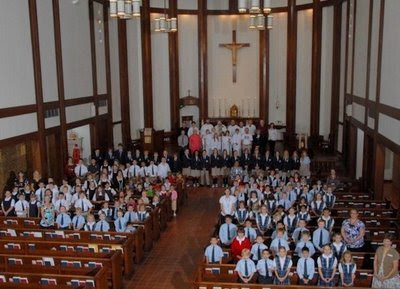 That is our entire student body standing together before the altar at the end of the school Eucharist in late September. This afternoon the diocese of Pittsburgh voted to realign with the Anglican Province of the Southern Cone and to depart from the General Convention of the Episcopal Church by a vote of 121 yeas (75.6%) to 33 nays, with 3 abstentions and a couple of spoiled ballots, in the house of clergy and a laity vote of 119 in favor (63.2%), while 69 voted against and 3 abstained. May our prayers be with them as this realignment is carried out on the ground, that it may be done with charity and a spirit of co-operation by those on all sides of the issue and that Christ may be further glorified in the realigned diocese. The diocese of Pittsburgh (Southern Cone) will hold a special convention to elect a bishop on November 7th. As Bishop Duncan is now a bishop in good standing of the Province of the Southern Cone, it is all but certain (God willing) he will be elected to resume his diocesan responsibilities in the realigned diocese at that time. In the meantime Bishop Duncan has been appointed by Archbishop Venables to serve as the Southern Cone's "commissary" in Pittsburgh until the November 7th special episcopal election, and the Standing Committee of the diocese has invited him to function sacramentally in the diocese until then.